Gas fires come in all shapes and sizes and the price of a new fire will vary extensively. Over the last few years the most popular gas fires are wall mounted and flueless, utilising a catalytic converter to absorb unwanted fumes. Due to the technology built into these fire we will not attempt a service. 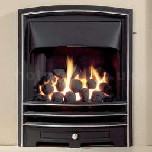 We at South Wales Heating will service your conventional gas fire from just £40. However this does not include parts that may need replacing and the engineer has a legal obligation to condemn faulty appliances. There is never an obligation on the customer to repair their fire or appliance with South Wales Heating and we welcome a second opinion. However be mindful that these second opinions may also incur extra charges. Our aims and objectives are to always put our customers first, and your opinions are welcomed at all times.